Dr. Tim Seelig started his career as a singer, making his European operatic debut at the Staatsoper in St. Gallen, Switzerland, and his solo recital debut at Carnegie Hall. 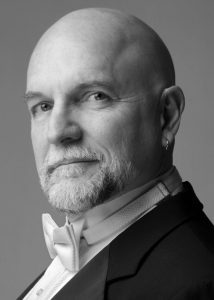 In addition to serving as Artistic Director of the San Francisco Gay Men’s Chorus, he continues a busy guest-conducting schedule throughout the U.S. and across the globe. He is Conductor Emeritus of the Turtle Creek Chorale (which he conducted for 20 years), co-founded The Women’s Chorus of Dallas, and taught on the faculty at Southern Methodist University. Dr. Seelig holds four degrees, including the Doctor of Musical Arts and the Diploma from the Mozarteum in Salzburg, Austria. He has authored seven books and DVDs on choral technique, including several bestsellers. His recordings have been on Billboard Top Ten and iTunes Top Ten classical charts. He additionally holds the distinctions of having conducted the Guinness Book of World Records’ Longest Choral Concert, as well as having been selected as a Community Hero to carry the Olympic torch.